At the weekend my dad asked me if I had a Nelson Mandela random selection for this week, and at the time I said no, because I thought it might be too late to do a memorial, but you know what, as he’s having a week of memorials, it seems like it might fit in after all, so here’s your Mandela-centric random for the week. 1. Did you know that Nelson Mandela’s first name isn’t actually Nelson? It’s Rolihlahla, which, by the way, you really need to get your phlegm going to pronounce – relatively easy for my Scottish and Irish friends, used to all the ‘ch’ sounds, but probably more of a challenge to your average Sassanach ;o) Anywho, a teacher at his school gave him ‘Nelson’ as a name when he was 9, as the custom was for every child to have a Christian first name. 3. Mandela, and his ANC brethren were actually on a terrorist watchlist in the US right up until 2008, after the South African government of the 1980s designated them a terrorist organisation. They were finally removed after a bill was introduced by Howard Berman to scrap the designation. 4. Although Mandela and Oliver Tambo opened their own law firm in 1952, thanks to a 2 year law diploma topping up his university degree, it wasn’t until 1989 that Mandela finally achieved a law degree while in prison, after 50 years of studying. 5. 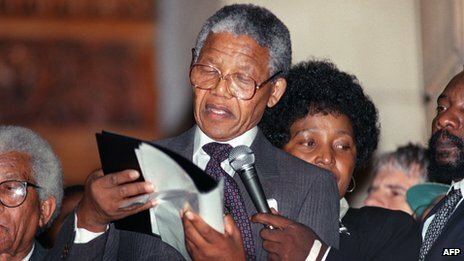 Upon leaving prison, a slightly surprised Mandela discovered that he’d left his glasses in prison, and had to borrow his wife Winnie’s in order to read a speech to the waiting press hoards. Wonderful random facts about a great man. 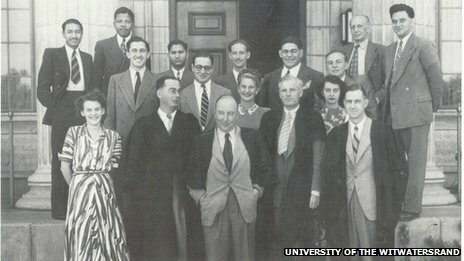 Interesting reading Katy, a great post. Good one my love. There are so few people like Madiba save perhaps Gandhi-ji. The world needs more like them – Northern Ireland for example. Wonderful randomness–thanks so much for this post. I thought #5 was really interesting. lovely, and so very interesting. I loved this, Katy. Thank you. love the one about the glasses!